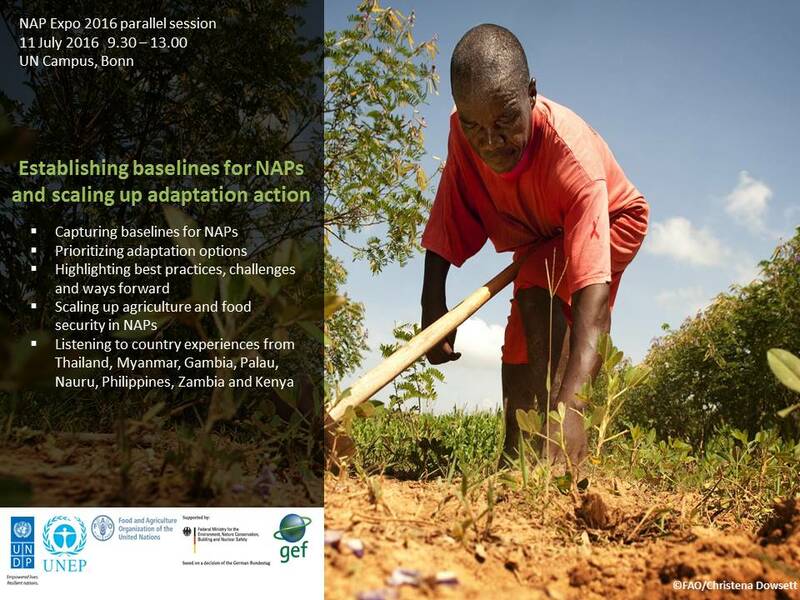 11 July 2016, 9.30-13.00 UN Campus, Bonn: This parallel session, held during the NAP Expo 2016, provided a platform to share experiences from developing countries in identifying baselines for adaptation plans. It also considered the prioritizing and scaling up of adaptation interventions, particularly focusing on the agriculture sector. As countries move towards implementing their NAP processes, this session showcased lessons from successful country experiences, with the aim to enhance countries’ understanding of adaptation options, and to help identify best practices and draw recommendations. Developing baselines, and using these to prioritize and scale up adaptation interventions, can in turn support robust and good-quality NAPs. The session discussed tools and methods that are being used to establish baselines, such as stock-taking and assessments and also explored the challenges of data gaps and data silos, and how these can impact on planning for adaptation measures at the sectoral and country level. Much of the groundwork that needs to be captured in baselines has taken place through the establishment of national climate change frameworks and plans, adaptation strategies at the local level and national level and in the NAPAs for the LDCs. Platforms for capturing both climate information as well as well as platforms that aggregate ongoing adaptation interventions were discussed. There were two sub-sessions, on Capturing baselines for Adaptation Plans and Prioritizing adaptation options, both leading with country experiences, to highlight best practices, challenges and ways forward. Two programmes supported this session; the BMUB-funded FAO-UNDP programme Integrating Agriculture in National Adaptation Plans (NAP-Ag) and the GEF LDCF and SCCF funded joint UNDP/UNEP NAP-GSP.